This black women’s t-shirt has a message that I totally support. 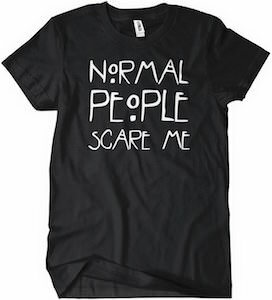 On this shirt is says “Normal People Scare Me” and yes there are some fun shapes in there to to make the letters look more fun. And yes who trust normal people? I for sure don’t because if you think you are normal what does that means? There is no normal verification tool so basically you are just as crazy as the rest of us. So a black women’s shirt that tells you she is scared of normal people and this shirt comes in sizes Small – 2XL and is made from 100% cotton. Tell the world the message by wearing this Normal People Scare Me T-Shirt. This t-shirt just simply asks “Why be normal?”. And that is of course a great question to ask. If the world around you is normal then I probably gone say no thanks and do my own thing. 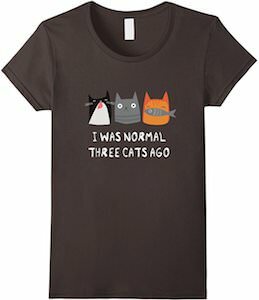 But on the other hand if you already not “Normal” then wear this t-shirt and get some smiles. This funny t-shirt comes in all kind of colors, sizes and styles for men, women and kids. Get your Why Be Normal? 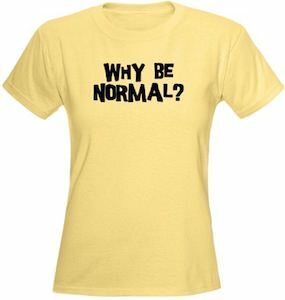 Posted on August 21, 2013 March 25, 2016 Author GeorgeTags funny, kids size, men's, normal, Women'sLeave a comment on Why Be Normal? Normal is safe, normal is reserved, normal is to easy to do! 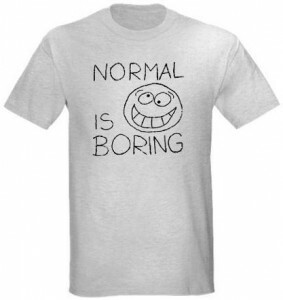 This t-shirt features a cool saying “NORMAL IS BORING” in what appears to be hand printed, aswell as a very odd and funny looking hand drawn smiley face, with crooked eyes and funny smile, this face is anything but normal. Check out the many sizes,styles and colors to choose from and make this 100% cotton t-shirt your favorite go to t-shirt for any occasion.